This is the first in a series of articles that examines the enterprise GIS phenomenon and its implications for GIS users, IT professionals, and the organizations they support. GIS technology is in the midst of a major transformation. The desktop products that have been the foundation of GIS work for decades, while still essential to the efforts of most GIS users, are being supplemented in many organizations with new application server-based and on-demand GIS capabilities. In the process, GIS is emerging as a vital enterprise-class technology that opens up a wealth of opportunity for both government and private industry. GIS users are at the forefront of this evolution, but it's the nontraditional consumers of GIS who stand to reap the greatest benefits. 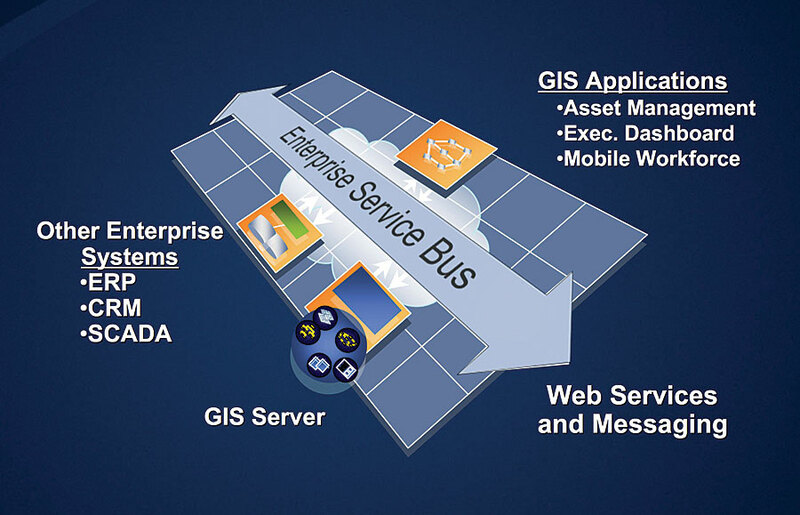 Enterprise GIS is a platform for delivering organization-wide geospatial capabilities. So what is enterprise GIS? If you ask a dozen people, you'll likely get a dozen different answers. To reach agreement on the meaning of enterprise GIS, we must first agree on a definition for enterprise. We define an enterprise as an organization or community of interest tasked with supporting a defined mission and set of objectives. An enterprise is composed of functional areas, people, processes, and systems. We further believe that successful enterprises provide for the unfettered, yet secure, flow of information among the people and systems that support the enterprise's mission and functions. Enterprise GIS is a platform for delivering organization-wide geospatial capabilities, a method that provides for this free flow of information. Data managementAmong the most powerful of GIS's capabilities, data management takes on an even more important role in an enterprise setting. Enterprise GIS data management focuses on the efficient storage and retrieval of all of an organization's relevant geographic information. An enterprise GIS's data may still be decentralized, but appropriate standards and governance processes ensure that it is available to everyone in the organization that would find value in it. VisualizationLong the focus of most users new to GIS, the visualization of information in a geographic context provides an intuitive means for accurate and rapid decision making. Visualization is frequently the most obvious manifestation of enterprise GIS, at least in its early stages; however, enterprise GIS should more fully exploit visualization capabilities by incorporating them into tasks and activities not traditionally associated with GIS. Spatial analysisExploiting the wealth of geographic information in an organization is the goal of spatial analysis for the enterprise. It is this capability that nontraditional users of GIS will most greatly benefit from. A key objective of enterprise GIS architects and designers should be the geospatial enabling of other enterprise systems (e.g., business intelligence applications) with spatial analytical capabilities. 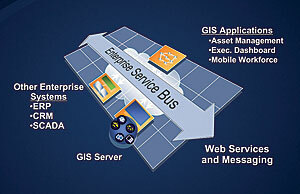 A critical ally of GIS users in the delivery of enterprise GIS is their IT organization. IT staff generally understand the enterprise technology paradigm and, once exposed to GIS's value, are quick to embrace the technology. The successful implementation and integration of enterprise GIS requires users to partner with IT departments and adopt this new paradigm, one where technology is regarded not only as useful and important but also as a critical component in the operation of an organization. IT staff know how to select, architect, and integrate enterprise technology. They should also understand that enterprise GIS cannot be considered in isolation from other enterprise technologies and strategies. The enterprise GIS phenomenon is one we can all embrace because it promises to benefit everyone, GIS and business professionals alike. Like all change, it will require adjustment and a new way of thinking, but the benefits will be worth it. It would be a challenge to find a GIS manager whose goals don't include the widespread use of GIS in the organization. Embracing enterprise GIS is the best means of achieving this goal. In future articles, we will explore the origins, methods, benefits, and challenges of enterprise GIS. We will also discuss how to plan for and architect an enterprise GIS and, in so doing, promote GIS to enterprise status within any organization. For more information, contact Dave Busser, Esri (e-mail: dbusser@esri.com), or visit www.esri.com/enterprisegis. Also read "Is Your GIS Enterprise?."